Like its sister game, Plenty of Fruit 20 Hot slot game, this game is a classic-style slot game with old-school features and symbols. The only difference between the two is that, when you spinning a winning combination in Plenty of Fruit 20 Hot slot game, the winning symbols light up and the reels fill with the flames of victory. This slot is great for beginners as there are no extra complicated bonus games or bonus rounds which you need to get your head around to understand the convoluted rules. Slots aficionados who enjoy simple fruity slots will enjoy this, as will pyromaniacs or any other fan of: Ultra Hot Deluxe, Sizzling Hot Deluxe and Sizzling Gems. 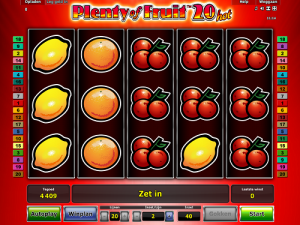 Plenty of Fruit 20 Hot slot game is jam-packed with classic slot symbols from days gone by. Slots have been around for the better part of two centuries and the symbols haven’t changed too much! Of course, there are many other slot games out there with crazy themes and loads of different symbols, but classic slots with classic symbols are still around and still popular. The symbols in Plenty of Fruit 20 Hot slot game range from fruits, including the likes of: bitter lemons, juicy oranges, red cherries, succulent watermelons and purple plums. The other symbols in this game include: the red seven, the golden bell and the golden star. The aim of the game, like in many other slots, is to spin at least three matching symbols in consecutive reels on a winline, to get a payout. The size of the payouts will depend on your bet, which you can change at any time (except when the game is in ‘autoplay’ mode) by using the plus and minus symbols to increase or decrease the amount you’re betting on each winline. Plenty of Fruit 20 Hot has two special symbols: the Wild and the Scatter. The Wild symbol in this slot is a red 7 with the word ‘wild’ written underneath in gold. This Wild symbol substitutes for all other symbols except the Scatter. The Scatter symbol in Plenty of Fruit 20 Hot slot game is a golden star on a red background. This golden star Scatter symbol pays wherever it lands on the reels. As with most other NovomaticCasino.co.uk games, you can play Plenty of Fruit 20 Hot slot game for free until you’re ready to start winning the big bucks! Once you’ve got the hang of the game, you can put the game into ‘autoplay’ mode and watch as the reels spin themselves without you having to do a thing! Out of autoplay mode, you can gamble your wins. In Plenty of Fruit 20 Hot slot game, the gamble feature is a classic double-or-nothing feature where you’ll need to choose whether you think the next card in the pile will be red or black. Get it right and you’ll double your bet, with the chance to do so again and again, but get it wrong and you’ll be back at the reels with nothing! Here at NovomaticCasino.co.uk, we have so many games for players to choose from! They’re all fair and very entertaining! Our slot selection includes plenty of jackpot slots which regularly give out life-changing sums of money as jackpots and these include the likes of: Jingle Jackpot, Jackpot Crown and Gemstone Jackpot. We also offer players a wide range of table games and live dealer games which they can stream straight to their computer or mobile device. Our live dealer games are brought to you using the latest technology and offer players a super-realistic way of playing casino games from the comfort of their own home. Play with a real dealer at a real table, in real time! Choose between: Live Poker, Live Roulette, Live Blackjack and Live Baccarat. Join a table and transport yourself directly to Vegas!